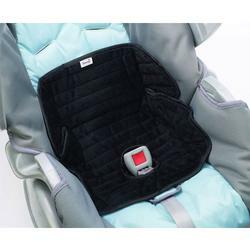 The award-winning Deluxe PiddlePad waterproof seat liner protects car seats, strollers and joggers from diaper blowouts and potty-training accidents! The PiddlePad is made with soft, absorbent velboa fabric that is comfortable and absorbent. A waterproof outer layer prevents leaks and keeps car seats and strollers dry and clean. A unique bucket shape contains the mess and holds more than 1 cup of fluid! The safe, contoured design fits easily and discreetly inside the childs seat and works with all harness systems.